Mountain Prairie Farms donated $5,000 to La Junta Associated Charities and $5,000 to Feed My People – I Am to fight hunger in the community. 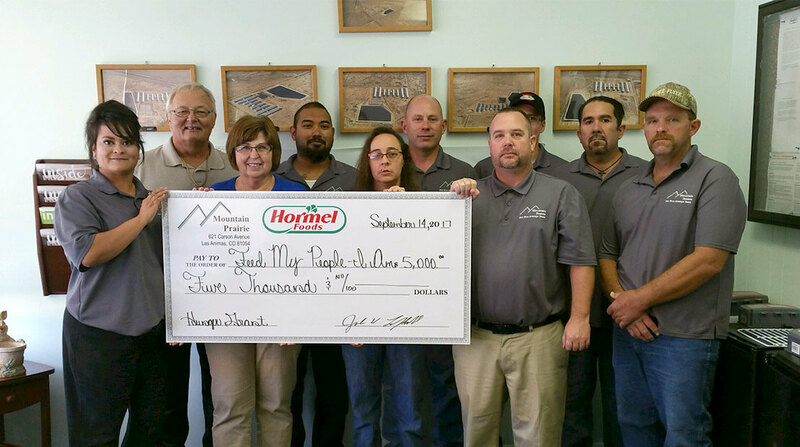 Mountain Prairie (Las Animas, Colorado), the local farm operation owned by Hormel Foods Corporation, announced Sept. 15 that it has donated $5,000 to La Junta Associated Charities and $5,000 to Feed My People – I Am to fight hunger in the community. This is the seventh consecutive year Hormel Foods has given funds to its U.S. manufacturing facilities to share with nonprofits in their respective communities to fight hunger. In 2016, Hormel Foods donated $350,000 to local hunger relief organizations in 35 U.S. communities where it had manufacturing facilities, bringing the program’s total contribution to local hunger relief efforts to more than $2 million thus far. Through this program as well as disaster relief efforts and other donations, Hormel Foods contributed $7.4 million in cash and product donations to help address hunger in fiscal 2016.